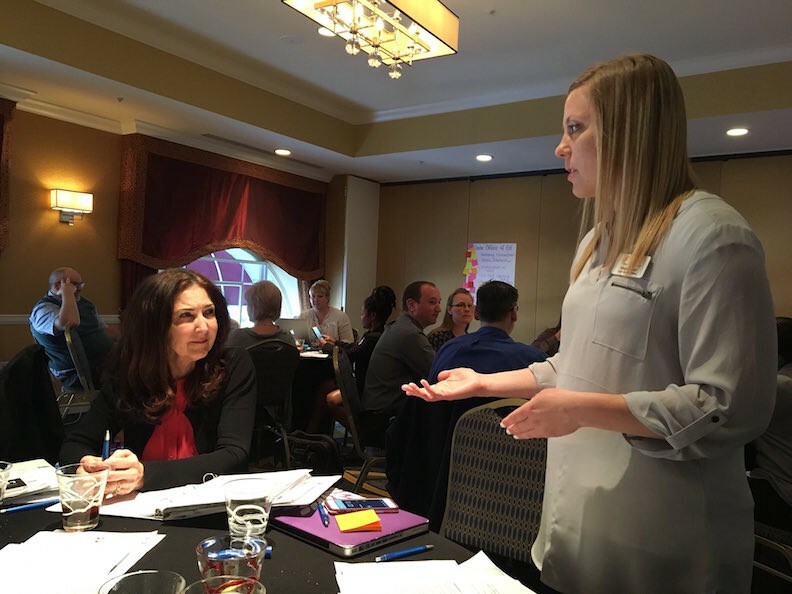 The Utah Teacher Fellows recently conducted a statewide data collection on the topic of teacher leadership, and more than 2,000 teachers weighed in! As we meet with policymakers now to share our educator-sourced recommendations on how the Utah State Board of Education, state legislators, and other decision-makers can support teacher leaders — and the full report can be found on our website here — the question posed most frequently is, “What exactly is a teacher leader?” We know they are looking for a list of job duties or a one-line description, but there isn’t just a single definition of a teacher leader and that’s the beauty of it. Teacher leaders can emerge in all school settings, in all subjects and grade levels. Their leadership abilities can arise in an area of passion that is unique to them and doesn’t have to fit into a designated job role. That being said, we have found some commonalities in educators who really get what the teacher leadership movement is all about. Teacher leaders love what they do! This love drives them to do their best, research what’s best for students, and constantly improve their practice. Their love for teaching makes it easy for them to share what they know. Not only do teacher leaders share knowledge but also enthusiasm. They exhibit a level of enthusiasm that is infectious. Teachers and students around them notice this and are encouraged by it. Anyone can be a leader and share what has worked well for them. You don’t need a title or to have won an award, but you do need to be good at what you do to be taken seriously as a leader in your profession. There is no application to be a teacher leader. While there may be limited positions for administrators and formal instructional coaches, there is no ceiling for teacher leaders. In fact, the more teacher leaders we boast across our state and across the nation, the better! Teacher leaders want all students to have the best education possible. They have a vision of every classroom being successful with empowered teachers. With this mindset, teacher leaders are doing what they can to help their school, district, and other schools and districts. Using any opportunity they get, teacher leaders are happily sharing ideas and best practices with other teachers, and are genuinely concerned for all students no matter what school they attend. Teacher leaders aren’t hoarding opportunities or afraid to have other teachers succeed; it’s just the opposite. Teacher leaders encourage other teachers to grow and lead. They invite their colleagues along and celebrate their success, because a teacher leader knows that the successes of any teacher elevates the profession and is a win for all teachers. So often teacher leaders are operating as leaders or modeling leadership throughout their normal work day. They don’t seek titles, acknowledgement, or extra money. These leadership opportunities happen without a title or compensation. It all starts with caring about students and teachers. Teacher leaders have a natural ability to build caring relationships and share their expertise. It happens every day and you could miss it if you aren’t paying attention. A teacher leader might spend a few minutes before school discussing how to help a teacher with a lesson. It can happen after school when giving ideas of how to reteach and help a student that didn’t understand a concept the first time. Teacher leaders understand that building positive relationships help their colleagues feel comfortable to ask them questions. Coaching and mentoring positions with adequate time and compensation would increase their influence, but teacher leaders know they can be leaders while working in their classrooms and are happy to do so. Every teacher is different and unique, just as every student is unique. Teacher leaders know what works for one teacher or classroom might not work for another. They are respectful of other teachers’ ideas and opinions. No matter the problem, teacher leaders work with others to discuss solutions, even if the solution may differ from teacher to teacher. Problem-solving is done best with respect, creativity, and passion, all of which teacher leaders use daily. Teacher leaders recognize that educators, parents, administration — and, yes, even legislators — all want what is best for students. Teacher leaders know that when they approach issues with a solutions-oriented mindset, they will be able to solve the problem. Student success is our focus. Teacher leaders have a desire that their own classroom is successful and that all classrooms are successful. This desire makes them a powerful tool for good. Are we giving teacher leaders opportunities to have the greatest influence possible? It’s not just the super vocal, super recognized/”decorated” educators that can serve as teacher leaders. It’s the “quiet riots” who, once tapped, are unstoppable. Let’s find the natural (maybe quiet) teacher leaders and support them. Give them more opportunities to lead, teach, encourage, and inspire those around them. It will empower teachers and help every student be successful. Bridget Varner is an elementary school teacher in the Alpine School District and a 2017–2019 Hope Street Group Utah Teacher Fellow. Tabitha Pacheco directs the Utah Teacher Fellows program, and previously represented her state in the 2015–2017 cohort of National Teacher Fellows, which did research on teacher preparation. You can follow Bridget on Twitter via @bridget_varner, Tabitha via @tabitha_pacheco, and stay up-to-date with the Fellowship happenings via @HSG_UT.